Changes in real estate business models and how buyers and sellers engage has pushed real estate agents and brokers to expand their service offerings over the past 10 years. Unfortunately, that growth has led to an increase in real estate lawsuits. So as your business activities expand, so should your real estate E&O — to keep your business protected adequately. Here’s what to consider to help reduce your risk of real estate claims. Does Your Current Real Estate E&O Cover That? When adding new real estate services to your business, consider how they could increase your claims risk. Do you know if your current real estate E&O policy covers your new activities? Specific activities covered vary by policy — as well as by state. Depending on what new services you’re considering, you may need to expand what your E&O policy covers. As a broker, if you add agents to your team, you’ll need a company E&O policy. And you should also consider a Business Owner’s Policy. Before you renew your real estate E&O, be sure your policy covers you for all of your current activities. When you work with a real estate E&O specialist like CRES, your policy can include coverage for each of the options above. And you can customize your policy for your specific activities, so you only pay for what you need. This information can be researched through your local real estate association or through the United States Department of Justice website. 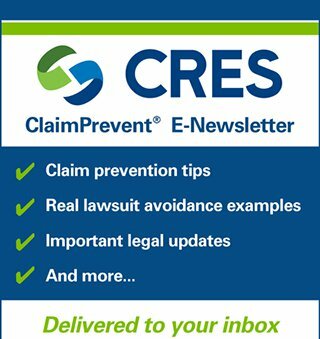 You’ll also find sample letters, disclosures, and Legal Updates in the CRES Resources pages. With every new service, there are aspects that increase liability and claims risk. Guessing how to adequately complete a form, file a contract, or conduct a transaction is going to greatly increase your risk of a real estate lawsuit. Consult with your real estate attorney to learn how to avoid these risks and claims in advance. CRES real estate E&O + ClaimPrevent® comes standard with legal advisory services 7 days a week. You’ll have on-call access to local real estate litigation attorneys to help you during and after transactions, to prevent small issues from becoming claims. If your E&O doesn’t offer this service, contact CRES today. What services have you added to your business that required a change in E&O? (Or are you wondering if you need additional coverage for something?) Share your story or questions with us in the comments below!